Culinary excellence, the spice of life, and Charmaine Solomon. A Holy Trinity within the Australian food world. For over thirty-five years, Charmaine Solomon has written recipes for magazines and cookbooks, performed a myriad of cooking demonstrations, and held inspiring culinary classes, to the delight of Australians everywhere – especially those who love good Asian and Indian cuisine. Over ten years ago, Charmaine released her own range of gourmet spice blends, and today they’re just as mouth-watering as ever. And they’re still made with no added MSG, no artificial colours or flavours, palm oil or trans fats. 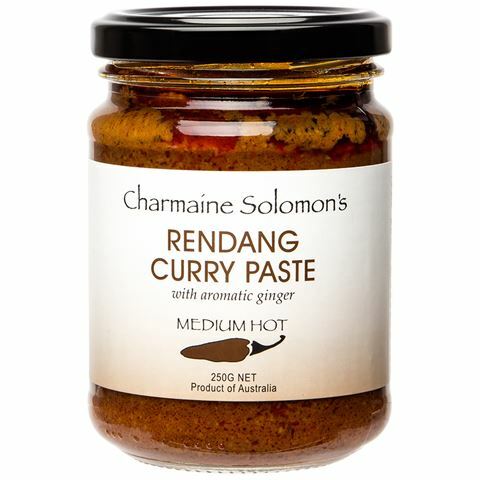 Charmaine’s superior spice blends are faithful to their exotic lands and dishes, and are manufactured in Sydney from market-fresh ingredients and whole and ground spices. Rendang is a legendary curry; a perfect blend of herbs and spices, the tang of salt, the sweetness of sugar and the earthy flavour of kemiri nuts and ginger. It works as equally well with beef as it does with chicken, so feel free to experiment in the kitchen with this authentic Rendang Curry Paste. No artificial colours or flavours, palm oil or transaturated fats. Contains a blend of spices, onion, garlic, ginger, galangal, shrimp paste, cane and palm sugars, tamarind, fish sauce, lemon grass, salt and kemiri nuts.